Why Is Wrist Extension Important for Kids? Did you know that wrist extension plays a role in good handwriting? 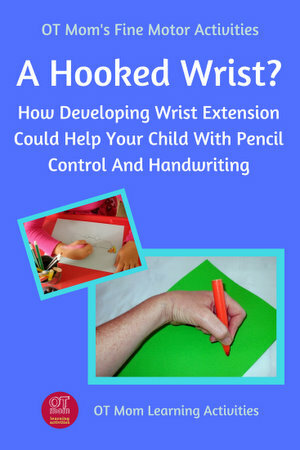 The position of the wrist determines how well your child will be able to control a pencil. Try it yourself and see! Hold a pencil in this position with your wrist bent forwards (flexed) and try moving your fingers. They probably feel stiff with not much movement happening. Now hold a pencil in this position with your wrist extended (hand comes up) – now try moving your fingers. You should be able to get more movement of the pencil with greater control over your fingers. The muscles which cause the fingers to bend (flex) and straighten (extend) are actually situated in the forearm. The tendons of these muscles run over the wrist bones to attach to the bones in the fingers. When you hold your wrist in a slightly extended position, the muscles operating the fingers can pull the tendons (and therefore the finger bones) more easily, which results in better control of the fingers for handwriting. Many children hook their wrists, or have flat wrists when they write, as you can see from the picture alongside. 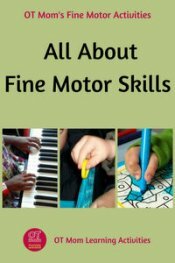 Some may do this because their fine motor skills are poor or because they have a degree of low muscle tone. Poor shoulder girdle stability may also cause a child to lean his or her whole arms on the table, thereby needing to hook the wrist to get the pencil into the correct position. Hooking the wrist will affect the control the child has over the pencil, so ideally we want the wrist to be held in a slightly extended position to help the fingers move more easily. Working on wrist extension is also particularly important for left handed children, who tend to hook their wrists in order to see their written work. We also want the wrist to be stable, in other words to be held in position without constantly lifting up from the table and hooking. Many children with a degree of low muscle tone, or with poor fine motor skills, may lack good wrist stability. They often lift their wrist up from the table while writing, and may also write with movement from their wrists instead of their fingers. This is very tiring, and usually leads to messy work. 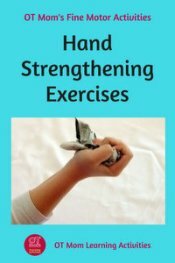 There are some simple wrist stretching exercises and ways of adapting regular activities to help your child achieve a more functional wrist position. 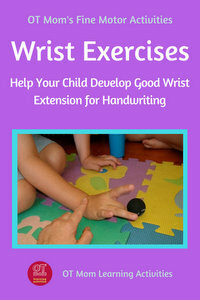 Check out my page of wrist exercises for kids for lots of photographed ideas and tips! 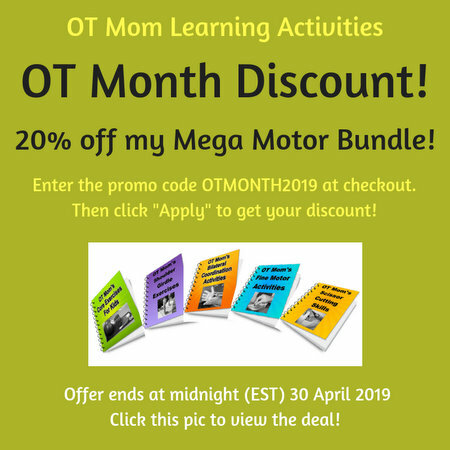 This information about wrist extension, wrist exercises and MUCH more can also be found in an accessible downloadable e-book format. 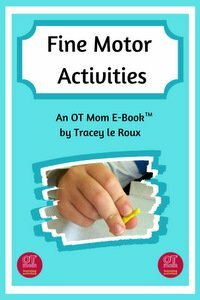 Check out my fine motor e-book for more details. Why not sign up for my free, occasional newsletter, to keep in touch with new and updated pages on my site?